EDDIE ECKER COUNTY PARK at the end of Navy Road is not a formal playground but a great open park space on Fort Pond Bay for frisbee, lawn games, running wild, walking the dog, etc. No fee. Henry “Hank” Zebrowski Memorial athletic fields with playground at S. Edgemere and S. Erie Ave with restroom facilities. No fee. Hither Hills State Park, playground located in the parking area with restroom facilities. The park has a beach open from Memorial Day to Labor Day; bridle paths; hiking trails; a scenic ten-acre, handicapped-accessible picnic area with fireplaces; playing fields; courts for horseshoes, basketball, volleyball, and tetherball; and accessible campsites, with showers and dumping stations. Additional facilities include a park office, camp store, and centrally located phones. The park is patrolled by New York State Park Police and maintains a large recycling program and requires a $10 parking fee. Montauk Community Church (at S. Etna Ave. and S. Etna Pl.) No fee. Montauk Lighthouse located in the lower parking area, also many charcoal grill stations with restroom facilities. Requires an $8 parking fee. Montauk Playhouse located at 240 Edgemere St, Montauk. Open to the public Mon-Fri from 11:30 AM – 2:30 PM and 5:00 PM to dusk. Also open Sat-Sun 9:00 AM to dusk. No fee. The Montauk School (enter at 2nd House Rd and S. Eaton) No Fee. Limited restroom facility. No fee. Located in the heart of Montauk, at 721 Main Street, The Candied Anchor is a 1950’s sweet shop with a modern sensibility. Equal parts classic Americana and organic Bohemia, The Anchor is sure to delight even the most stubborn sweet tooth. In it, you’ll find party supplies, baked confections, ice cream, quirky retro gifts, and, of course, all the candy you could possibly want. Located at Gosman’s Dock, Captain Kid is the oldest and best toy store in Montauk. with an awesome collection of wooden trains and automobiles, hard to find toys, Legos and craft kits, cute t-shirts, puzzles and more, for children of all ages with a variety of interests – you have to visit! On the Circle, just off Main Street, Fudge N’ Stuff is jam-packed with goodies, including 30 different kinds of fudge, and, yes, they’ll slice you a taste so you can sample until you find your favorite. An eye-popping assortment of old-fashioned penny candy, lollipops, gourmet jellybeans, cotton candy, hot popcorn, nuts, and chocolate-covered pretzels by the pound fill the shelves. Wonderful soft serve ice cream as well. Order an ice-cream cone, sundae, malt, or banana split, or a hot chocolate or cappuccino. They also sell piñatas for your parties. Cravings satisfied from 10am-11pm, 7 days in season. GO HERE NOW! Continue reading this guide over ice cream and a fishwich! A Montauk institution serving genuinely awesome burgers, fries, and all the best diner items you can think of (like the fishwich), plus the BEST HOMEMADE ICE CREAM ON LONG ISLAND, with 20+ flavors. The lines don’t lie… and yes, it’s worth the wait. Hit Harvest for dinner in their bucolic garden on the pond then walk over to John’s for a nightcap of succulent Cherry Vanilla ice cream…you’ll call the real estate broker on the way home. 11:30am–10pm. Montauk’s only full-service pharmacy also stocks everything from cosmetics to high-quality giftware, vitamins, newspapers, special occasion cards, books and magazines, appliances, jewelry and an extensive swimwear and clothing collection for adults and kids. Everything for a stay at the shore including toys, games, towels, bedding, postcards, and sunscreens. Popular with surfers, this beach is two miles east of the village on the ocean with parking by permit only at two parking areas. The super long break makes surfing ideal for newbies or veteran long-boarders. This iconic beach has beautiful cliffs rising at its western end at Shadmoor Park, restrooms, outdoor showers, lifeguards during the summer season, and concession trailers that serve more than just snacks. At the end of East Lake Drive on Block Island Sound; and named for the cattle gins, or pens, that resided here for hundreds of years, Gin Beach is great for families with children, with gentle water and sandy beaches. You can watch the boats come in and out of Montauk Harbor, or take a walk on the jetty. Parking by permit only. Restrooms, outdoor showers, a concession trailer, lifeguards during the summer season, and a nearby restaurant provide all the family needs for a day at the beach. Four miles west of town on Old Montauk Highway. Lifeguards daily from mid June–Labor Day. Non-campers pay a $10 parking fee. Nice playground, picnic tables, outdoor showers, restrooms, a changing area, and a general store. West of the Village by the IGA supermarket, this sandy beach stretches over 500 feet. Park for free at Kirk Park parking lot. Public restrooms located next to the parking lot. Lifeguards, restaurants and stores are within walking distance, along with a park and picnic area across the street. The dunes on this beach were recently stabilized and stairways were put in place. On beautiful Fort Pond Bay at the end of 2nd House Rd. Great for launching kayaks, paddleboards, and small boats. A favorite spot for locals and families. The beach is pebbly, so take swim shoes. Parking by permit only. Dine waterside at Navy Beach, just down the beach. Boats and small yachts frequently moor in the Bay. A great place where kids can be kids! CMEE one of the most visited museums in Eastern Long Island. CMEE upholds its mission “to spark imagination and foster learning for children of all backgrounds and abilities and to build strong connections within the East End community by providing playful experiences” by presenting educational exhibits and programs and by partnering with other arts and social service organizations to address issues that concern families in the community. Private Parasail Charters. Make our Montauk Parasail experience a day to remember with family and friends. For all ages, 500ft and 1,000ft parasail rides. Enjoy happy hour on a sunset cruise along the beautiful coastline of Montauk Point. You may see abundant sea life, including dolphins, turtles, and whales. Enjoy Banana Boat rides – weather and environmental conditions permitting. Open 8:00 AM to 8:00 PM 7 days a week. Puff n Putt Family Fun Center is located in the heart of Montauk Village on the waterfront of Fort Pond. Puff n Putt has been owned and operated by the Cucci Family since 1977. On any given day you will be “greeted and treated” like one of their own by any of the 19 family members that are actively on site. The mini golf course has 18 holes that range from simple to challenging making the course fun for the entire family. If you score a Hole-in-one on the 18th hole you win a free game for next time! Come give it a try. The boat rentals are sure to please the beginner or experienced. Fort Pond makes learning to sail, kayak or paddle board a safe and comfortable place to learn. For the more adventurous, head out across the mile and half long waters and enjoy the perfect winds for sailing and pedal boating. Come out to Rita’s Stables for so many things! Pony rides for ½ hour for a family and children (5 years old and up) at your home or at the stable, petting farm and sunset private rides. They also offer lessons, birthday parties and summer pony camp. Call 631-668-5453 for reservations. SoFo is a family-friendly natural history museum of exploration and discovery for children and adults of all ages. SoFo is highly regarded for its outstanding nature exhibits, its beautiful setting adjacent to the Vineyard Field Preserve and the six-mile trail system of the Long Pond Greenbelt, and its over 250 annual on and off-site educational programs led by the museum’s knowledgeable nature educators offer direct observation and hands-on experiences relating to the rich natural heritage of the area. We strive to raise environmental awareness by providing the inspiration and tools for all of us to become caring and responsible stewards of our planet. Deep Hollow Ranch has pony camps for kids 7–12. Camp sessions run from June to August. Private lessons also available. Campers can sign up for 5 sessions per week or 3 sessions per week. Kate Tempesta’s Urban Golf Academy at the Montauk Downs. Offering all day (9:30am–2:30pm) weekly Golf/Swim Camps, and a Golf/Tennis/Swim Camps for ages 4–7 and 8 and above. Also offering an Evening Eagles Golf Camp, (Mon-Thurs, 5:00 PM-8:00 PM) for ages eight and up. Begins appx. June 20 and ends September 1st. Semi-private group lesson designed to get kids stoked on surfing as they learn different surfing techniques and styles (i.e., stand-up paddle surfing) alongside other kids with professional instructors. Previous instruction preferred, but not required. Ocean safety, surf etiquette, and environmental awareness are also taught. 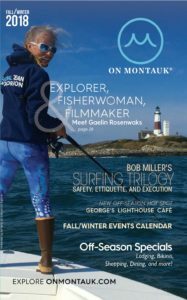 Sail Montauk offers a Junior Sailing Program. Each boat is limited to 4–5 students with a certified instructor. Students learn sailing basics with hands on participation. Two week long sessions, Monday-Friday from 9:30am–12:30pm. Our goal is to help everyone in the water be safe and comfortable, learn to swim or become a more adept swimmer, and last but certainly not least, enjoy the water and have fun in the Hamptons! Swim lessons are offered to all ages, all Hampton locations and at all levels. A Tale of Two Sisters Bookshop offers Children’s Arts and Crafts every Thursday from 4:30 PM-5:30 PM. Private music lessons are available upon request. Air and Speed Surf Shop offers surfing instructions for ages 7–14. Camps are offered during July and August. Every camper, regardless of experience, gets one-on-one attention and will be trained how to read the surf, paddle out, and catch a wave. The pièce de résistance of Montauk camps since 1964 provides a traditional summer day camp experience in a safe and nurturing environment for children 4–12. Located on 5 acres bordering Fort Pond. Flexible scheduling. It’s THE camp.